We all have those friends or family members or even coworkers that require a *special* gift. These are the people that don't exactly fit a typical gift recipient mold. They may have unique tastes or hobbies or just be...ahem..."interesting" people. Either way, they require some unusual gifts. 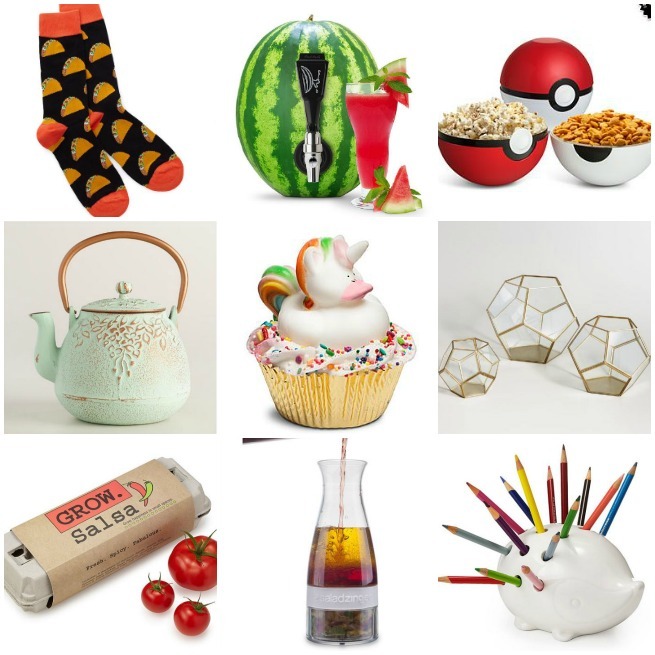 Being the queen of unusual gifts, I put together a list of ideas for those *special" people in your life! Taco Socks - Because why not? Poke Ball Serving Bowls - For the Pokemaster in your life! Brass Geo Terrariums - Everyone loves a terrarium since they are easy and low-maintenance! Percy the Pencil Porcupine - For the coworkers with funky office stuff. Oil & Vinegar Infuser - Foodies will love this! Salsa Grow Kit - This could be for your green-thumbed friends, those that are super granola-farm-to-table ish OR even those that have black-thumbs since the kit is pretty foolproof. Light Green Cast Iron Teapot - This is so pretty and dainty and really would make a great gift for someone you know who loves hot tea. You could even fill the teapot with different kinds of tea for an extra special gift! Magical Unicorn Cupcake Bath Bomb - Everyone loves baths. Everyone loves unicorns. Everyone loves cupcakes. So, win - win - win! I almost bought the taco socks last week.